Clothes that work well and should be kept as foundation pieces. Clothes to alter to be more flattering and versatile. (Sue will advise). Unsuccessful purchases that will NEVER make you look or feel good. These should be weeded at the earliest opportunity. give you inspirational ideas on how to wear the clothes you own. 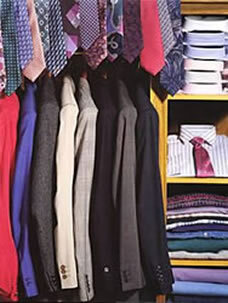 provide a short, realistic "wishlist" of cost effective purchases to transform the versatility of your wardrobe. This service is charged at an hourly rate of £50. To avoid making poor clothing investments in the future, book a Full Men's Image consultation for detailed advice on colours and styles that create the most successful looks for you. If your lifestyle is very casual and you never need a suit, you could discover the wide range of colours that will add interest and versatility to your look with a Colour Analysis for Men.